Tube List: 5Y3GT (1), 6AK5 (2), 6H6 (1), 6L7 (1), 6SA7 (1), 6SG7 (2), 6SJ7 (4), 6SK7 (1), 6V6 (1). 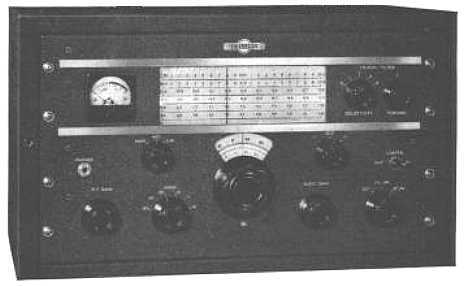 The Collins 75A-1 receiver is first with many new electrical and mechanical performance features covering the 160 thru 10 meter amateur bands. It is a dual conversion design with fixed HFO IF. Selectivity choices include five positions for the crystal filter (approximately 5 kc to 200 cps bandwidth) and that of the 455 kc IF transformers for AM operation. Operating modes for the receiver include AM and CW. Accurate tuning is accomplished through the use of a slide rule dial and a vernier dial calibrated in 1 kc increments (2 kc increments on the 10 and 11 meter bands). Ten turns of the vernier dial cover each of the band ranges. A series noise limiter is used for AM and CW operation. Front panel controls include: Band Switch, Main Tuning, On-Off-Standby Switch, Crystal Selectivity Switch, Crystal Phasing Control, RF Gain Control, Audio Gain Control, CW Switch, CW Pitch Control, AVC Switch, and Noise Limiter Switch. Accessories include an external cabinet mounted speaker (270G-1). 115 vac, 50-60 cycles; power consumption is approximately 80 watts. Image rejection better than 50 dB. IF rejection better than 70 dB. Drift is negligible after warm-up and varies only slightly with line voltage variations. Extreme stability is provided by the crystal controlled first conversion osicllator and the permeability tuned second conversion oscillator. Approximately ten turns of the vernier dial per frequency range. Within 1 kc (160 - 15 meter bands), within 2 kc (10 and 11 meter bands). 1 uv for 6 dB signal-to-noise ratio and 1.0 watt audio output at a bandwidth of 4 kc. Crystal Filter, 5 positions: 4 kc to 200 cycles nominal (6.0 dB points). Fixed I.F. : 13 kc (60 dB points). Audio output level is within 5 dB for an RF input change of 5 uv to .5 v. Delayed, amplified AVC circuit. 70E-7 permeability tuned oscillator (PTO). 300 ohms nominal (unbalanced, balanced). Speaker: 3-4 ohms / 500 ohms. Receiver: 21 1/8" W, 12 1/4" H, 13 7/8" D.